Flickr hosts an unbelievable amount of images and photos of all sizes on their servers. One easy way to search Flickr for Wallpapers is to simply enter the term wallpaper in the search box on the Flickr homepage and browse through the results. 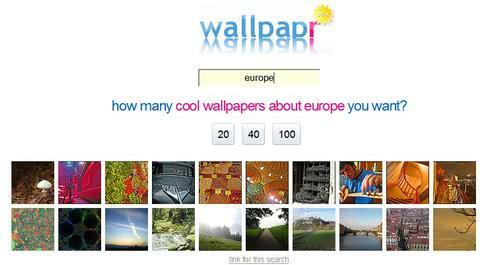 Currently more than 260.000 images are found when searching for wallpapers. While this manual method reveals lots of potential wallpapers it is on the other hand time consuming. Only four or five images are displayed before you have to scroll to take a look at the other images on the page. Wallpapr is a search engine for Wallpapers on Flickr. It displays up to 100 wallpapers on a single page with no scroll bar which means all thumbnails are displayed above the fold on the result page. That's ideal for quickly browsing through a lot of images that are hosted on Flickr as you save lots of scrolling and page loading times this way. You can either enter a search term and take a look at the wallpapers found that way or click on the 20,40 and 100 buttons which displays a selection of random wallpapers as the result. If you do not enter a search term the buttons reveal random wallpapers, if you enter a search term the button determine the amount of results that are displayed. A click on a thumbnail loads the image at Flickr with the possibility to download it in various sizes. The photos you find here are usually of high quality, likely taken from one of Flick's wallpaper groups. The site operators have released an application for Apple's iPhone and iPod Touch which makes available a similar functionality but optimized for said devices. Wallpapr offers one of the most convenient options to browse the Flickr photo hosting site for wallpaper images. You should try using Piclens and searching for pictures on Flickr or maybe DeviantArt.. Check it out – it’s fantastic!